Call it street art, call it reverse graffiti, or call it architectural sculpture - whatever it is, Portuguese artist Alexandre Farto's portrait series is mesmerizing and fascinating. Farto has been interested in street art since he was 13 years old and now this 23 year old artist has taken up scratching faces into the facades of buildings all around the world. These architectural embellishments, or rather subtractions, are hauntingly beautiful and created using jackhammers, picks and hammers. A street artist since he was 13, Farto is also known as Vhils and began his career painting trains on a railway line near his home in Seixal. Farto has traveled all over Europe and even into the US to compose and chip away his portrait series. You can find his faces in Moscow, Italy, London, Portugal and NYC. Some are quite large and take over the entire facade of a building, while others are small and tucked away and others yet are almost imperceptible and like a ghost image play tricks on the eye. For his scratched portrait series, called “Scratching the Surface”, Farto first paints the wall with his subject using the paint as a guide for the removal process. Then he uses a jackhammer, picks, hammers and his own hands to chip away and peel back the plaster or concrete facade. What remains is a relief of the face and a wonderful contrast between the smooth facade of the building and the ruble behind it. 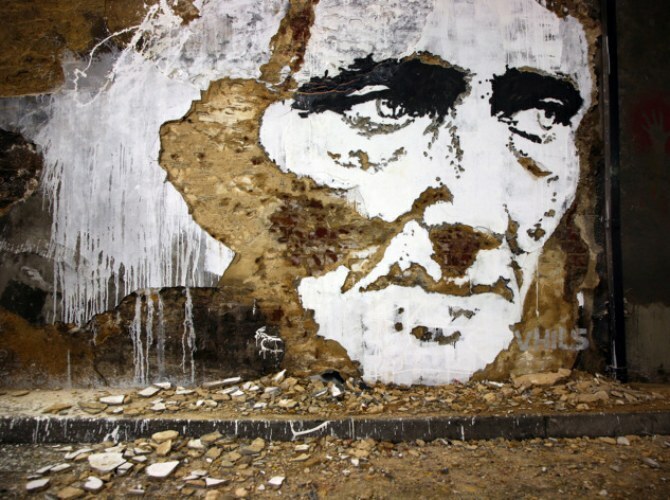 A street artist since he was 13, Farto is also known as Vhils and began his career painting trains on a railway line near his home in Seixal. Farto has traveled all over Europe and even into the US to compose and chip away his portrait series. You can find his faces in Moscow, Italy, London, Portugal and NYC. 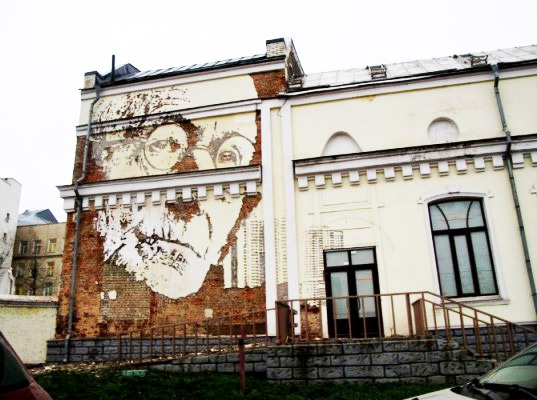 This portrait is located in Moscow and takes up an entire section of the building. This double portrait of the famed old woman and young woman is located in London. This large installation is also located in London. Some of the portraits are quite large and take over the entire facade of a building and others are small and tucked away, while some are almost imperceptible and like a ghost image play tricks on the eye. This small portrait is tucked into the side of a wall in London and shows the many layers of painted plaster on the wall. For his scratched portrait series, called “Scratching the Surface”, Farto first paints the wall with his subject using the paint as a guide for the removal process. Then he uses a jackhammer, picks, hammers and his own hands to chip away and peel back the plaster or concrete facade. What remains is a relief of the face and a wonderful contrast between the smooth facade of the building and the ruble behind it. This inscription is located inside a building in Portugal. This portrait is also located in Portugal and you can watch the making of it on a youtube video. This small portrait is located on a pillar inside an abandoned building in Portugal.